Chicago, Feb. 6, 2019 /PRNewswire/ -- Tacton, a leader in Configure Price Quote (CPQ) and design automation, today announced that it will be demonstrating Tacton CoDesigner at SOLIDWORKS World 2019, being held February 10-13, 2019 at the Kay Bailey Hutchison Convention Center, Dallas, Texas. The 21st annual SOLIDWORKS World brings together designers, engineers, managers, and partners to discuss ideas, trends, and technology shaping the future of product design. 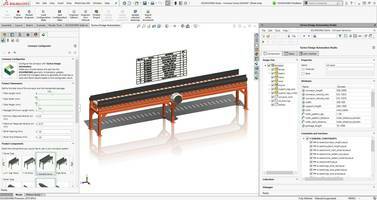 Show attendees will see how Tacton CoDesigner, a new addition to the design automation product portfolio, and SOLIDWORKS software simplifies custom product design. Now customers can conceptualize the product during each phase of the design process to gain a detailed understanding of it, all the way from initial design to production and delivery. As a SOLIDWORKS Gold Partner, Tacton delivers a new level of collaboration with cloud-based Tacton CoDesigner driving enormous cost and time savings by empowering product, engineering and sales teams to identify product design concerns and effectively manage approvals throughout the development process. "In the water treatment industry, lead-time is often more important than price," according to Brian Bartholomew, Environment Senior Project Engineer at ClearStream Environmental, a leading provider of process equipment for the water and wastewater treatment industries. "With the SOLIDWORKS and Tacton Design Automation, once our proposal is accepted, design goes through engineering in just a few days, then out to fabrication. This type of automation has been a key factor in our business growth." "The power of Tacton CoDesigner and SOLIDWORKS gives engineers the tools and productivity to streamline product development and reduce errors," said Nick Iwaskow, Director, Alliances & Partnerships, SOLIDWORKS, Dassault Systèmes. "At SOLIDWORKS World, attendees can receive a unique glimpse into how they can use Tacton CoDesigner for engineer-to-order automation inside SOLIDWORKS. With a high level of interactivity, ease of use and maintenance, engineers can easily configure designs of complex products and automatically generate complete 2D drawings, 3D models and quote documents." "Using Tacton CoDesigner and SOLIDWORKS together in a cloud environment is the next step in the evolution of product development for manufacturing," said Tacton CEO Frederic Laziou. "By giving engineering and sales teams early and more powerful insights into every stage of product development, we are giving them a real competitive advantage in the race to get getting the right products to market, while reducing the risks of design flaws and costly engineering order errors by 30 percent." Sunday, Feb. 10, 6:30 p.m.- 6:45 p.m.
Pawel Dabrowski, VP Channel Sales, will showcase how Tacton Design Automation is the preferred design efficiency tool for manufacturing. With web-based Tacton CoDesigner, Tacton brings collaborative configuration and design to sales and design engineers so they can focus on customer needs and innovation at the same time. Wednesday, Feb. 13, 8:30 a.m. - 10:00 a.m.
Jason Jensen, Design Engineer, ClearStream Environmental and Chris Price, Design Automation Developer, ClearStream will explore the flexibility of Tacton Design Automation. Attendees will learn how to automate SOLIDWORKS parts, assemblies and drawings, and discover the ease and benefits Tacton offers. See layout mode in action for use in teams that provides modular development, and learn how to improve design times without using the API. SOLIDWORKS is a registered trademark of Dassault Systèmes in the US and other countries. Other brand and product names are trademarks of their respective owners.